I had so many positive memories while studying at Buffalo State; it is difficult to pick just one. 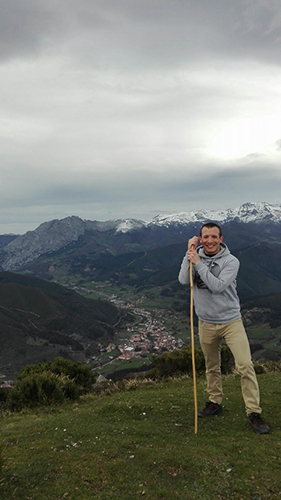 I think the memory that really steps out from the rest is when the MCL department rewarded me with a one-year study abroad scholarship in the city of Santander, Spain. Dreams really did become a reality. The scholarship gave me a once in a lifetime opportunity to live in a foreign country, take classes at the local university, and student teach at a local school. Yes, but I wish that I would have gotten involved much sooner. I joined the Modern and Classical Languages (MCL) Department’s “Los amigos de la tertulia” during my final year at Buffalo State. I regret not joining in my first few years at Buffalo State. Buffalo State’s MCL Spanish Education program left me feeling more than capable to be able to teach Spanish in any part of the world. The teacher preparation program is phenomenal. I had such amazing experiences learning how to be a language teacher. I left feeling that I could truly teach anywhere I want because of the knowledge and expertise that I gained in the program. Without the inspiration, support, or encouragement of Buffalo State’s MCL department, I wouldn’t be where I am today. I have returned to the same city that the MCL department study abroad scholarship rewarded me with back in 2012. I have been teaching English and science in Santander, Spain ever since. The world is a very big place and in my opinion much friendlier than perceived. Leave no stone unturned and do not be afraid to venture out of your comfort zone.